I've been working the past few days getting new pouches ready. 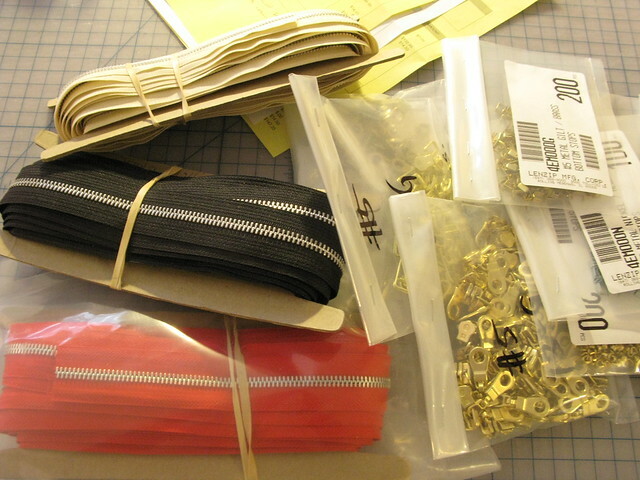 Just got more zipper supplies in the mail, just in time because I had run out. I have enlisted Jesse to help me make them because there are just so many to make it's almost insane. My hands are killing me and I've started wearing leather gloves while pulling the teeth. I hope by the end of this week there will be a substantial update! In the mean time I've restocked a few colors in shop until I get around to taking a set of new photos. Also, after this update all the zippers of all pouches will have a leather toggle on them. That's mainly why I want to take new stock photos, but until then you can imagine it. A note on colors: I've had many inquiries about the mint colored leather. Unfortunately I am all out of this and in all likelihood will not get it again. In the meantime I will search high and low to find something comparable. Additionally, are there any colors you would like to see? Do you like printed/striped/patterns linings or solid linings better? I try to mix it up a bit because I know everyone likes different things. A note on sizes: I've also had many inquiries about making custom sized pouches and I am happy to do this if I have the leather in stock. Just shoot me an email. Okay, good night folks! p.s. Wow, this photo really stinks. Good thing I'm getting a new camera soon.